The internet is not just for funny cat videos (although those are important too.) It’s also the perfect place to find yourself somewhere to park your hard earned savings. Yes, online savings accounts are all the rage - and for good reason. We’ve got the lowdown on all the facts, features, highs and lows of online savings accounts to help you make an educated decision about whether these accounts will be the right fit for you. And then you can get back to watching Mittens fall off high places. Start comparing savings accounts below. Pretty much what it says on the tin. Like everything else these days, savings accounts are now available over the internet, so you don’t even have to leave your lounge room to stash your rainy day fund away. When we talk about online savings accounts, it generally means savings accounts available exclusively online, as opposed to other savings accounts with internet banking options. In addition to your traditional banks, online accounts are often offered by online-only banking providers, which means there’s no physical bank branch involved. Whether or not that’s a good thing, is up to you to decide. Online savings accounts: are they good value? Short answer? We think so. There’s been a trend towards online savings accounts among the winners of the Mozo Experts Choice Awards in the last two years, because they tend to offer savers competitive rates and convenient features. That’s made possible because online banks don’t have the overhead costs of their brick-and-mortar counterparts, so they can pass the savings on to customers in the form of high rates and low fees. The bottom line is, they give you a pretty solid return on your money to help your savings pile can grow faster. Is an online savings account safe? These days, online banking and online savings accounts are pretty secure. Of course there’s always the chance that something will go wrong - but there’s always that chance with traditional savings accounts as well. There isn’t a huge difference anymore between the security features of online and traditional banks, because these days, even most traditional banks have online accessibility. Most online savings accounts come with security features like SMS codes for when you make online purchases, transaction monitoring and an automatic logout if your account has been open but inactive for a while. Beyond that, in Australia, all savings accounts, including online savings accounts, are insured by APRA up to a balance of $250,000. That means that if anything happens to your online bank - say they go bust - the government guarantees that you won’t lose your savings. All savings accounts listed on our site are covered under the Government’s Deposits Guarantee scheme. 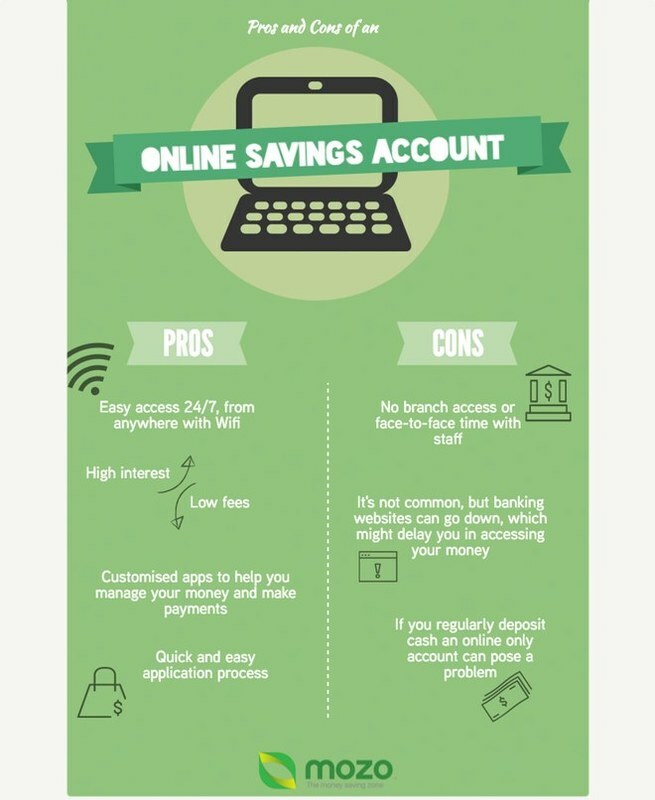 Is an online savings account right for me? Basically, you’re trading up branch access and seeing real, live, human staff members, for higher interest, less fees and 24/7 online access to your money. It depends what’s important to you and how you like to save and spend your money. Another thing you’ll have to consider is how you’ll access the money in your online savings account. Most online banks are now able to provide ATM and debit card services through partner banks with physical presences, which means you should consider the best transaction account to link your online savings account with. Some online banks will allow you to link your savings account to a transaction account at any bank, while others require you to have a transaction and savings account at the same bank. When you choose an online savings account, look at what linked transaction accounts are available to you as well and make sure they’re competitive, as this is often where you’ll be hit with extra fees and charges. A lot of savings accounts offer high bonus interest rates as long as you meet certain requirements, like a minimum deposit or zero withdrawals in a month. Keep an eye on the conditions and put strategies in place for meeting them - for example, having your salary deposited directly into a savings account is an easy way to meet minimum deposits. Make saving an obligation, as much as paying rent or electricity bills. Work out a monthly budget, and decide how much money you can afford to put away each month. Then when you get your paycheck, that amount is automatic savings - no ifs or buts about it. Plus, this can help you keep up your bonus interest rates! Having something to work towards will help keep you motivated to save, whether it’s something tangible - like a holiday to Rome - or just a figure you want to hit, say $10,000. Remember to keep it realistic, so you don’t end up getting discouraged. Check out our savings goal calculator to crunch the numbers and see if your current savings plan will get you to your goal! Take a break from cat videos, and head over to our savings account comparison table to find the best place to park your stash. It’s so quick and easy, you’ll be back to all that quality viewing material in no time.